After two months of being MIA from Iron Cupcake: Earth I’m glad to get back on schedule. When I saw this month’s ingredient, summer berries, I knew I had to come up with something. This is my first entry this month, the strawberry pie cupcake. 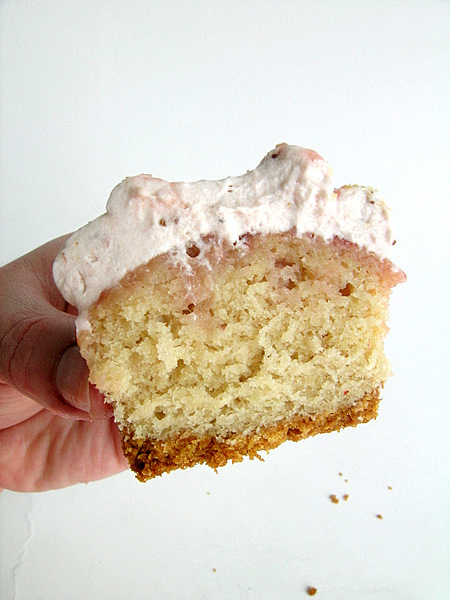 A graham cracker base was baked into the bottom of the cupcake liners, then they were filled with strawberry cake. Once they were done baking, a teaspoon or so of strawberry syrup was drizzled on top of the cake, then they were frosted with strawberry whipped cream. On the very top is a sprinkling of graham cracker crumbs and another teaspoon or so of strawberry syrup, along with a sliced strawberry. Now, sure it might look great, but I’m totally puzzled. Despite all the strawberries in these cupcakes, they do not taste like strawberries! What did I do wrong? The only thing I can think of describe the taste is just that they taste sweet. Any suggestions? Last and certainly not least, don’t forget our corporate prize providers: HEAD CHEFS by FIESTA PRODUCTS; HELLO CUPCAKE by Karen Tack and Alan Richardson; JESSIE STEELE APRONS ; TASTE OF HOME books; a t-shirt from UPWITHCUPCAKES.COM. Iron Cupcake:Earth is sponsored in part by 1-800-Flowers. For the cupcakes: Preheat oven to 350F. Line a 12-cup muffin tin with cupcake liners; set aside. Stir crushed graham crackers and melted butter together in a bowl until well combined. Place 1 tablespoon graham cracker mixture into the bottom of each prepared muffin cup. Use the bottom of a small glass to pack crumbs into the bottom of each cupcake liner. Transfer muffin tins to oven and bake until the edges of the graham cracker mixture is golden, about 5 minutes. Remove from oven and fill each muffin cup three-quarters full with cake batter – keep reading for instructions for cake batter. Place strawberries in a small food processor; process until pureed. You should have about ⅓ cup of puree, add a few more strawberries if necessary. Divide batter evenly among prepared muffin cups. Transfer muffin tin to oven and bake until tops are just dry to the touch, 20-22 minutes. Remove the cupcakes from the oven, poke several holes on top of each cupcake with a toothpick and pour 1-2 teaspoons of strawberry syrup (recipe below) on top of each cupcake. Let cool cupcakes cool for 10 minutes, remove from tin and then cool completely before frosting. For the strawberry syrup: In a saucepan, bring sugar and water to a boil. Gradually add strawberries; return to a boil. Reduce heat; simmer, uncovered, for 10 minutes, stirring occasionally. I took the mashed strawberries out of the syrup (set aside) and just used 1-2 teaspoons of the syrup to pour on top of the cupcakes after baking (I poked holes in the cupcakes first with a toothpick first so it could soak in better). With the rest of the syrup, I put it back on the stove and stirred in 2 teaspoons of cornstarch so it would be thicker to pour on the very top of the cupcakes. I returned the syrup to a boil, for one minute, then let it cool off completely before topping the cupcakes with it. You will definitely have leftovers – use it on pancakes or waffles intead of maple syrup! Put the mashed strawberries that you took out earlier back into the syrup, if desired. For strawberry whipped cream: In a large mixing bowl place the whipping cream, vanilla extract, and sugar and stir to combine. Cover and chill the bowl and beaters in the refrigerator for at least 30 minutes. When chilled, beat only until soft peaks form. Add the sweetened strawberry puree a little at a time, and beat just until stiff peaks form when the beater is raised. Taste and fold in more sugar or puree, if required. If you have any leftover, use it as a topping for a cup of hot cocoa or mocha! Those sound yummy! Whenever I make a cake/cupcakes that are supposed to be strawberry flavored (or some other flavor, maple, peach, raspberry, whatever) I usually add extract to match the flavoring. I find you rarely taste much of the strawberry or other flavor otherwise. So I would have used strawberry extract in place of the vanilla, or at least replaced half the vanilla with strawberry. It kind of depends on the recipe and how much extract it calls for. Sometimes a drop or two of extract makes frosting better too. I totally relate! For some reason, strawberries just don’t flavor cake very well. This makes me sad, because standard strawberry extract from the grocery doesn’t taste… shall we say… natural. le sigh. I probably need to invest in some high-end bakery flavorings. Tovie, thanks for the suggestions. 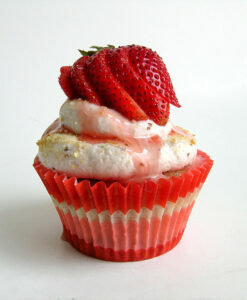 Next time I make strawberry cupcakes, I’m definitely going to use a strawberry flavoring to go with them! I’m sorry these didn’t taste as strawberry as you wanted them to, because they look amazing!